Young girls leap in front of Jewish worshipers, screaming 'allahu akbar,' 'the Jews are dogs.' Video shows Waqf man's lewd gestures. The Temple Institute reported on its Facebook page Tuesday that the "Muslim supremacists who dominate the Temple Mount" have come up with a new weapon against Jewish visits to the Mount  in the form of young girls. "Their latest gambit, paying men and women to inhabit the Temple Mount during the hours that it is open to Jews and follow the Jewish worshipers every where they go on the Temple Mount, screaming curses and allahu akbars at the top of their lungs, got a flat tire when the Israel police and security services shut down the organizations which were funneling the money from Hamas to the agitators," explained the Institute. "The newest Islamic projectile aimed at the heart of Jewish worshipers on the Temple Mount is little girls. 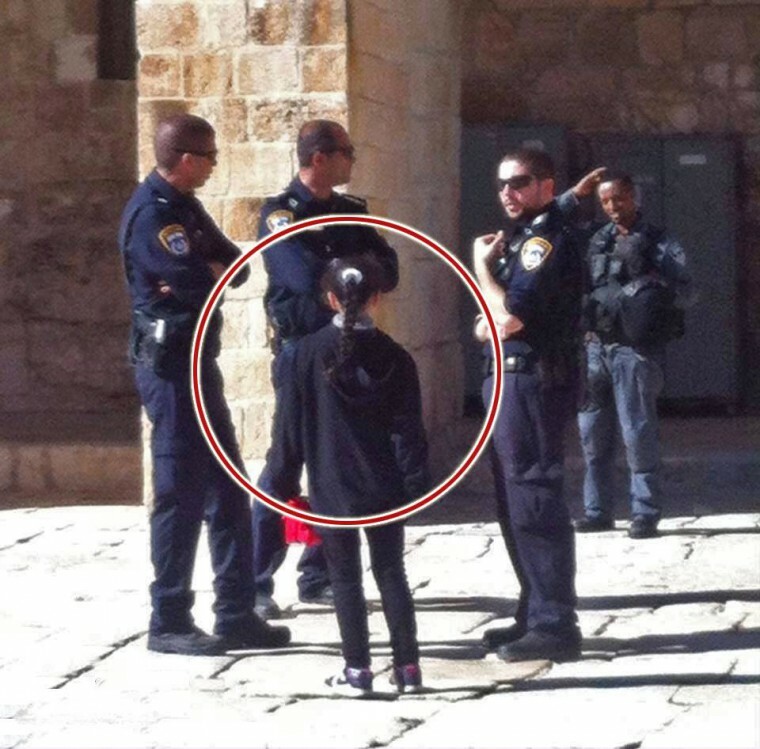 Young, pre-pubescent girls can now be found aplenty on the Temple Mount. Because they are Muslim, young and female, the Israel police won't touch them. The young girls, following the instruction and encouragement of their elders, feel free to leap in front of Jewish worshipers, screaming in their high pitched voices 'allahu akbar,' 'the Jews are dogs,' and whatever else comes to their innocent minds, while at the same time jabbing their fingers in the faces of the Jewish worshipers. "Sometimes the little angels get so wrapped up in their game of 'harass the Jews' that they even begin pushing the Jewish worshipers. "What is a self respecting, dignified human being to do in response?," asks the Institute. "Push the little things back? Pull on their pony tails? A group of six Jewish worshipers [Sunday] did what they thought was the responsible and appropriate thing to do: They called on the police to intervene. The police did, arresting the Jews and holding them in custody for more than 24 hours. "All this goes to prove the wildly successful effectiveness of the Muslims latest weapon in their ever improving arsenal in the war against the Jews on the Temple Mount." The Jewish youths who were arrested were represented by the Honenu civil rights organization, which said that the Jews were arrested in response to their demand that police arrest the Waqf men who had harassed them. Honenu's lawyer filed a motion with the Magistrates' Court to free the Jews Sunday but the motion was denied. He then appealed to the District Court but the judge said it was too late at night to hold a session and the Jews remained in custody overnight. The Magistrates Court criticized police for keeping the Jews in lockup overnight when they had already stated that they did not object to letting them go free. The judge determined that regarding three of the Jews, there was no basis for a claim that they had committed any offense whatsoever. She released then unconditionally. As for the other three, their only offense was to stand in place when they were urged to keep walking, and to demand that a girl who harassed them be arrested. These three were released on the condition that they stay away from the Temple Mount for 30 days. 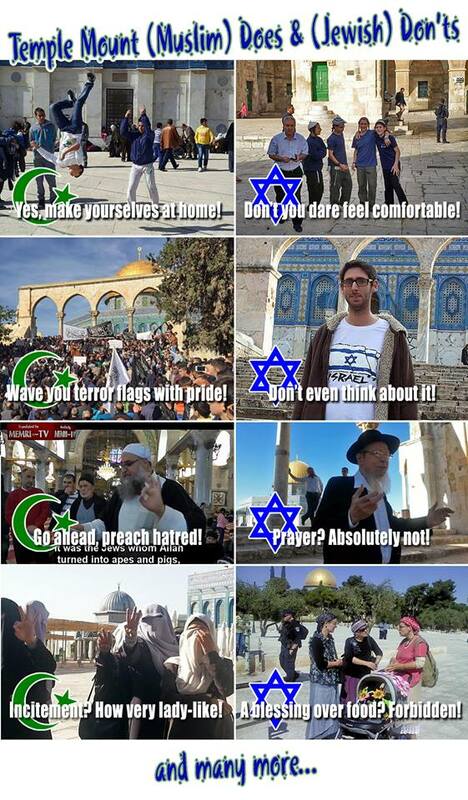 The videos, which were shown in court, show Muslims harassing the Jews on the Temple Mount Sunday  before the Jews were arrested. In one, an officer in the Muslim Waqf repeatedly gives the Jews the finger. See the included videos here, here and here. The first one is from the Elder of Ziyon website. It was made by Muslims and is entitled "Al Aqsa Child Care." ( From Bare Naked Islam, 6February2015.) The disparity between the restrictions put upon Jews by their own Government and the contemptuous disrespect permitted the Arabs by the same Jewish Government. 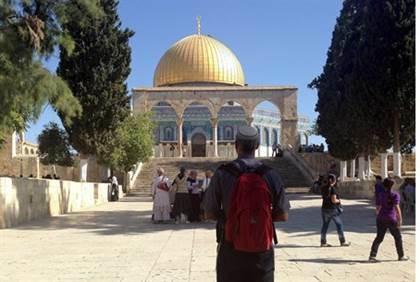 "Several dozen hareidi Jews, including children, ascended the Temple Mount Wednesday. In the course of the tour of the Mount, Muslims began hurling objects at the hareidim, spat at them, hurled shoes and sticks and pulled the sidelocks of one of the children. The raging Muslim mob terrified some of the children, who began to panic. At one point one of the Jewish men seeks to reassure the frightened children. "Don't be afraid! Don't be afraid! This is our place!" he said, referring to the Mount, the holiest site in Judaism. "The Temple Movement blamed police for failing to disperse the Muslim attackers. "It's a miracle no one was hurt," said a movement statement. Despite its importance as Judaism's holiest site, Jews are forbidden from praying on the Temple Mount in order not to "provoke" Muslim worshippers at the Al Aqsa Mosque Islamic complex, which is built on top of the ruins of the ancient Jewish Temples. Those Jews who break the rules against praying are often arrested and banned from visiting. But as in this case, even Jewish visitors who are not praying are sometimes subjected to abuse, threats and violence at the hands of Muslim worshippers." (6): Memri, 24Nov14. "In an impromptu sermon at the Al-Aqsa Mosque, Palestinian preacher Ali Abu Ahmad called upon Allah to annihilate America and its coalition. 'Oh Allah, enable us to cut off their heads," he said. We want a Caliphate that "will liberate Jerusalem from the Jews, the most vile of creatures," he said. The sermon was delivered on November 21 and was posted on the Internet.'"